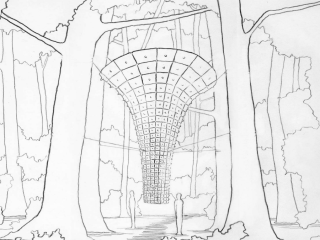 Join Seattle-based artist and avid explorer John Grade for a walk through the trees to discover his new commission Canopy Tower at Laguna Gloria. Inspired by the wind blowing off the lake, Grade has conceived a large-scale inverted tower assembled and carved from ipe wood and suspended from three trees. Canopy Tower hangs off the ground high enough for a viewer to duck inside into quiet isolation, allowing for two separate experiences of the piece: While the sculpture is stationary on the bottom half, the top half is given the flexibility to move with the wind.